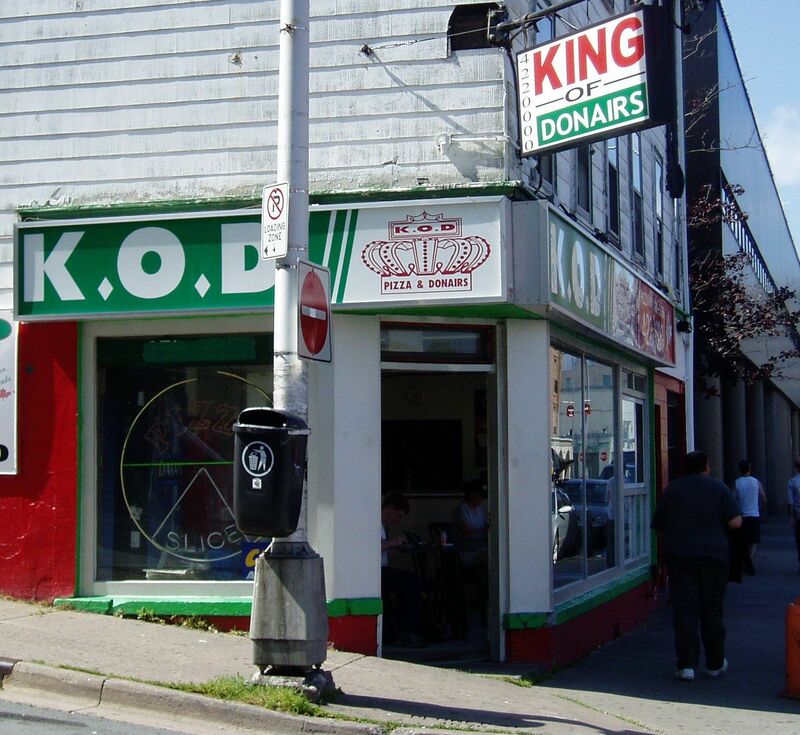 King of Donair, (KOD), is a restaurant chain founded in the early 1970s in Halifax, Nova Scotia. The first store was on Quinpool Road and serviced a broad clientele into the early morning hours when at the time only a limited number of eating establishments were open. KOD serves a wide range of food including the Halifax (or Maritime) donair, the super donair (sometimes served open-faced, with cheese), pizza (including donair pizza), poutine, and the taco sub. Now a staple at many pizzerias in Atlantic Canada, King of Donair claims to have invented the Maritime donair — a variation on the traditional Middle Eastern doner kebab in 1973. Maritime donairs are characterized by their distinctive sauce, a sweeter version of a traditional garlic sauce, made from evaporated milk, sugar, garlic or garlic powder, and white vinegar. Traditional garlic sauce is usually made with yogurt or mayonnaise instead of evaporated milk and vinegar; it also has lemon juice rather than sugar. Donair sauce is a popular dipping sauce for garlic fingers (another regional dish). Garlic fingers are an Atlantic Canadian dish, similar to a pizza in shape and size and made with the same type of dough. Instead of the traditional tomato sauce and toppings, garlic fingers consist of pizza dough topped with garlic butter, parsley, and cheese, cooked until the cheese is melted. Bacon bits are also sometimes added. They are often eaten as a side dish with pizza, dipped in donair sauce or marinara sauce. Instead of being cut in triangular slices, they are presented in thin strips, or "fingers". The dish is also popular in Wisconsin, where they are known as pizza fries. As of 2008, KOD has six locations throughout the Halifax Regional Municipality, as well as locations in New Brunswick. It has been prominently featured in a number of episodes of the hit TV series Trailer Park Boys, in which the character Randy (played by Patrick Roach) frequently visits for donairs, such as the episode "A Man's Gotta Eat", where he prostitutes himself in front of one store for coupons. In 2012, the King of Donair at Pizza Corner, one of their most popular locations, was forced to move, leaving the local landmark with only two pizzerias.